Home »Somatic Yoga Classes and Somatic Movement »About Somatics – what is it? Somatic Movement involves a series of specific exercises that reconnect the brain with the muscles so you can let go of tightness in the body. The movements are slow and mindful, and are performed on the floor, so your body is more comfortable and isn’t fighting against gravity. No pain = more gain! Anyone who has chronic pain, aches and pains or stiffness, or who wants to keep their body youthful! It doesn’t matter how old you are or how fit you are. The classes also help to improve your Yoga, Pilates or other sports. Yoga and Pilates can also help with pain, but somatic exercises are performed slowly and are mostly floor-based, so you’re not having to hold up your body. Somatic Movement also provides a sensory feedback loop from the brain: you’ll teach your brain to notice when muscles are contracted, and then educate the muscles to fully release and work in a more energy-efficient and pain-free manner. 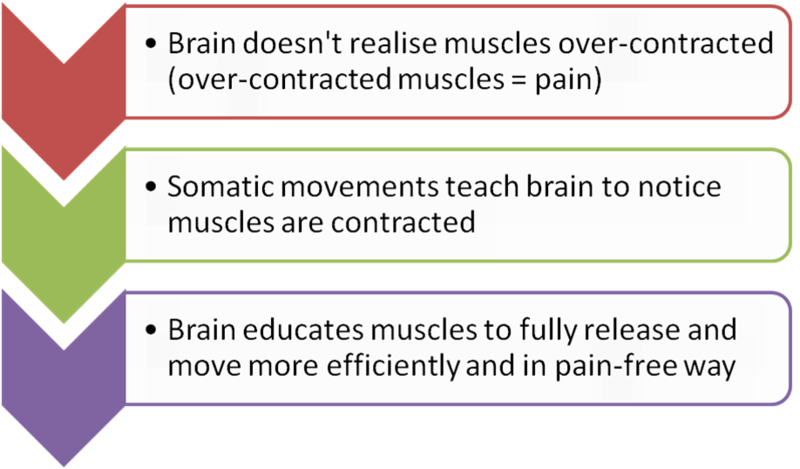 Somatics is not just about stretching and strengthening either: the problem isn’t that the muscles are short or weak, it’s that they’re exhausted from being constantly over-contracted. Once your muscles have been released and retrained in how to move correctly, they will then become naturally strong again. You’ll find that somatic movement will improve your Pilates or Yoga too – you’ll be able to move deeper and further, and with greater ease too. Please visit our frequently asked questions page for more information about payments, what to wear and what to bring. How will Somatics help my pain? Somatics addresses the root cause of WHY you are in pain and teaches you HOW to reverse it. When a muscle has been contracted over a long period of time, the brain accepts this as “normal” and doesn’t know it’s contracted – this is known as muscle motor amnesia. You are in pain because the muscles are constantly over-contracted, causing them to be weak and tired. These contracted muscles can then compress the joints and trap nerves, causing further pain. Your body tries to compensate, changing the way you move and using other muscles instead, which sets up a further pattern of pain. Please visit our Somatics page for more details of our classes and private sessions. Our classes are suitable for all abilities, ages and fitness levels.